What is the March for the Animals? our 2018 March for the Animals chairs, Jennifer Tegan and Alexandra Allmon. SPCA supporters, volunteers, staff, and fellow animal lovers, along with their pets, join in for a barking-ly good time! Sound like a lovely way to spend an October morning? We think so, and are asking you to join us, and to help raise awareness and much-needed funds for the medical care of the 1,600-1,800 animals that we take in each and every year. The easy walk, a little less than one mile, on the paved path of the F. R. Newman Arboretum at the Cornell Botanic Gardens makes for a perfect walking surface for everyone. Following the walk is a delicious sandwich and salads buffet lunch provided by Cornell Catering. The attractive and well-made March for the Animals t-shirt and tote bag with goodies donated by Ithaca Grain and Pet Supply AND printed with environmentally-friendly inks complete the take-home swag. What is needed to make this picture perfect is YOU! Your leashed dog is MOST WELCOME to join in as well. In fact, the more dogs (and the occasional cat in a stroller) we have, the merrier! The March for the Animals is the most important SPCA fundraiser of the year. We rely on the money raised to take care of our animals. It is also a "friend-raiser," and very much like the Relay for Life, the AIDS Ride, or Women Swimmin,' it relies on the exponential power of participation--you asking your friends for their help to meet your personally-set fundraising goal. All of this helps the homeless animals of Tompkins County. Think of it like this: If 116 marchers asked 16 friends for $16 (in honor of our 116 years saving animals) our fundraising total adds up FAST. (We think it totals $29,696 but we're no math whizzes). AND if each of your 16 friends gave more than $16 think how great that would be! Can we count on you to be one of the 116 marchers? What does my fundraising support? ALL of the funds raised help with medical costs and care for SPCA fur-babies. Whether cat, dog, puppy, kitten, ferret, bunny rabbit, gerbil, guinea pig we provide the medical care they need to find their forever homes. That is just what we are here to do. Help animals. 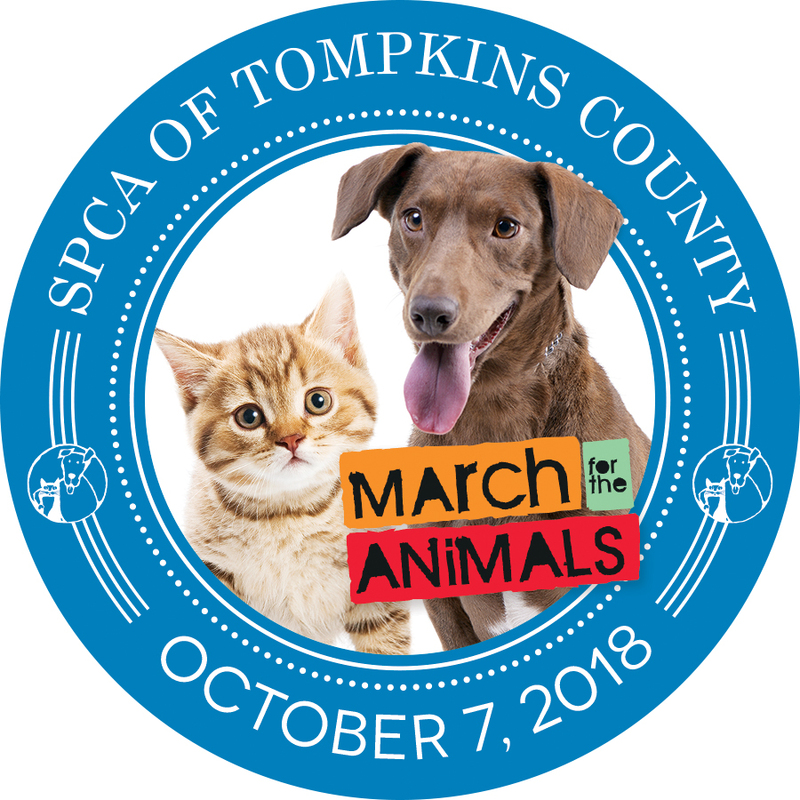 No matter how many friends you ask, individual participants and adult members of fundraising teams should try to raise the individual minimum of $100.00 (in addition to your registration fee) and youth marchers should try to raise $50 to really help the SPCA of Tompkins County animals. This year, of all years, we want to exceed our $100,000 goal as we celebrate 116 years of saving animals in Tompkins County. Check out our photo album of past fun! We hope to see YOU, your family, your friends, and your fur-pals there - just check out these photos from the 2017 March for the Animals! Click on the REGISTER button to sign up. 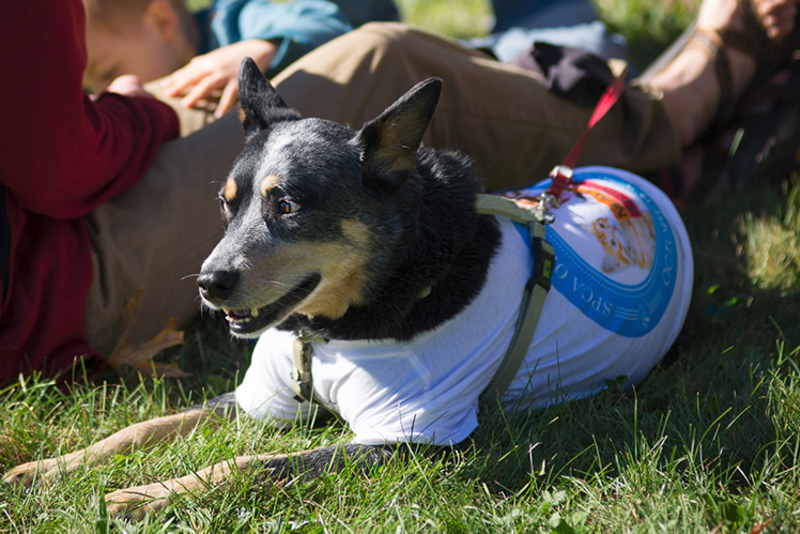 Your registration fee covers your 2018 March for the Animals t-shirt with environmentally-friendly inks, your cool canvas tote bag (all printed right here in Ithaca), and your catered picnic lunch hosted by Cornell Catering. Create a team of friends with a fun team name to generate even greater enthusiasm for your fundraising efforts. OR fund raise as your own tour de force! The sky's the limit! VIRTUAL MARCHERS: If you can't attend the March in person, that's okay! We have a loyal group of "Virtual Marchers" who raise funds for the SPCA online. If you will be out of town, or live out of town this is the registration type for you! Also, Virtual Marchers do not pay the registration fee that covers the lunch, t-shirt and tote bag. We will be in touch with you by email all throughout the fundraising period leading up to the March. In the meantime, mark your calendars for Sunday, October 7 at the F.R. Newman Arboretum at the Cornell Botanic Gardens. 10:30 check-in, welcome remarks at 11:00, and the walk begins at 11:15 followed by the buffet lunch. The mission of the SPCA of Tompkins County is to protect companion animals. We are the first open admission, no-kill shelter in the United States, and are dedicated to preventing animal cruelty and overpopulation. In 2016, we are celebrating 15 years as a no-kill shelter! The SPCA of Tompkins County was incorporated in February 1902 in an effort to prosecute individual cases of cruelty. In 1904, the organization acquired sheltering facilities and took over as ‘pound master’ for some of the municipalities within the county. For much of its history, the SPCA has employed humane officers to investigate individual cases of cruelty, as well as providing impound, sheltering and adoption of unwanted dogs, cats, and other animals. In 1999, the SPCA Board of Directors resolved to become a "no-kill" shelter, a vision fully realized by the end of 2001. In the spring of 2004, the SPCA opened the Dorothy and Roy Park Pet Adoption Center, a sheltering facility that provides dogs, cats and other companion animals with comfortable, healthy, home-like settings. Registered as the nation's first "green" LEED certified animal shelter (U.S. Green Building Council) for its environmentally minded, sustainable design, the facility is "good for people, good for animals, and good for the planet." The SPCA of Tompkins County is a registered 501(c)(3) not-for-profit organization governed by a board of directors. Our tax id number is 15-0624378. Visit spcaonline.com for much more information.